Wow, can you tell we’re between seasons right now?!? I’m on a roll with the whole cooking thing. And also, trying to use up the last of last year’s cuts before the new cuts are ready. We didn’t have a whole lot of unsold cuts this year (yeah! ), and, to be honest, there were some cuts we’ve been hoarding. So I was trying to think of something to do with cheddarwurst besides lay them on a bun. 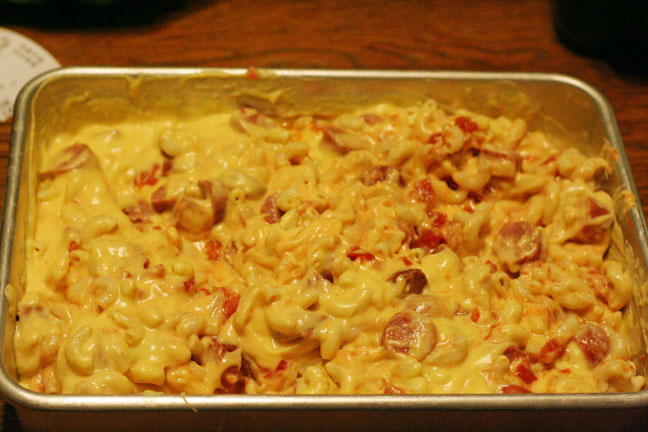 I decided to combine them with my favorite macaroni & cheese recipe from Betty Crocker 1955 (my grandma’s cookbook, which I love!) And then, I got really crazy. 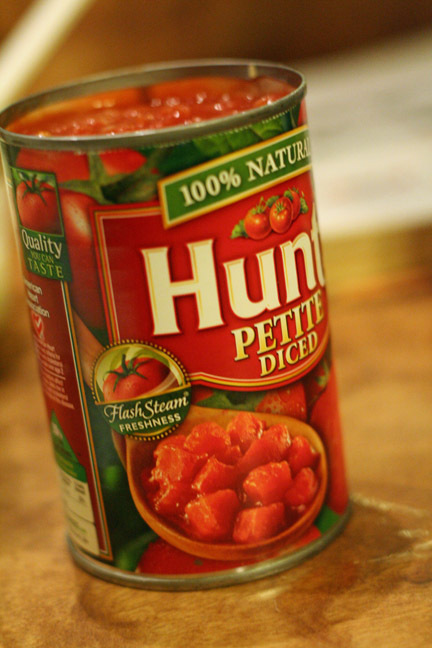 For some reason, tomatoes seemed like they’d be really good thrown into this mess. I couldn’t quite decide if it really would be good, or turn the whole thing into a big pan of disaster. But you know how we computer programmers are… risk takers! Yeah, that’s right. So in the tomatoes went, and everybody loved it. 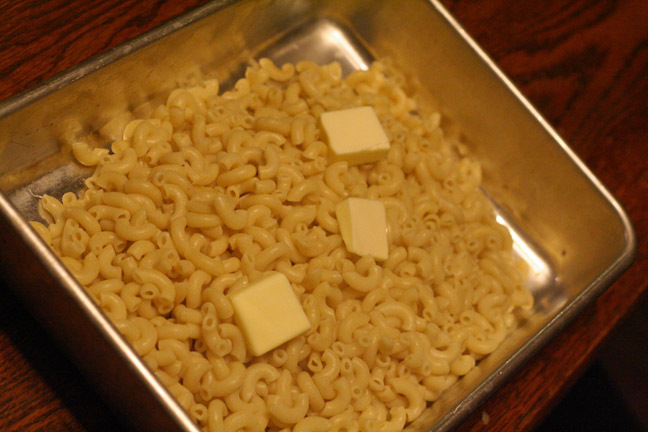 First, cook 2 cups of uncooked elbow macaroni according to package directions. Drain and dump into a cake pan with 2 or 3 tablespoons of butter. 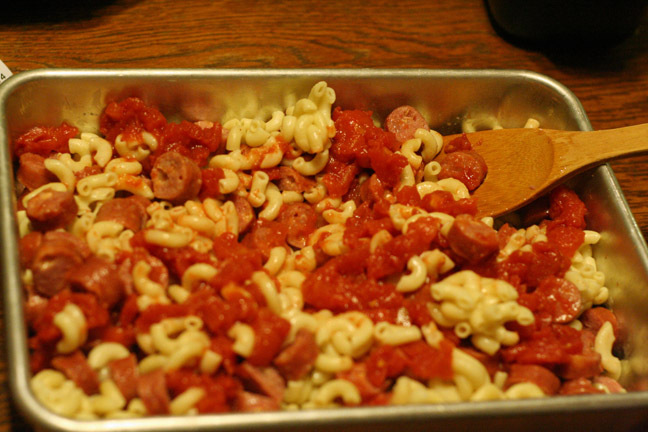 While the macaroni’s cooking you can put the cheddarwurst into a pot of water to boil, and start the cheese sauce. Now we’re multitasking, baby! 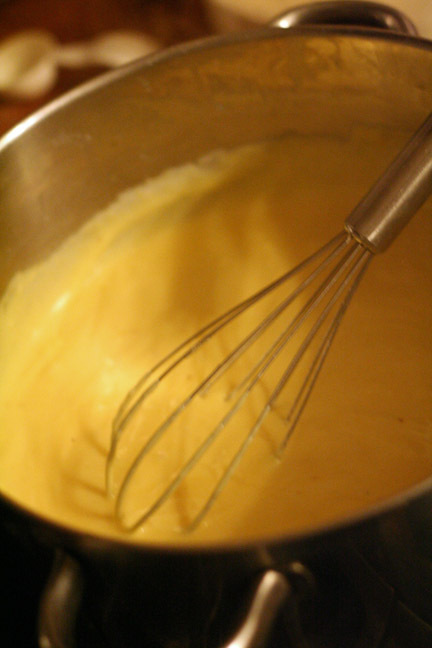 For the cheese sauce, melt 6 tablespoons butter in a saucepan. Whisk in 6 tablespoons flour until smooth, then cook a minute or so until it’s thick and bubbly. 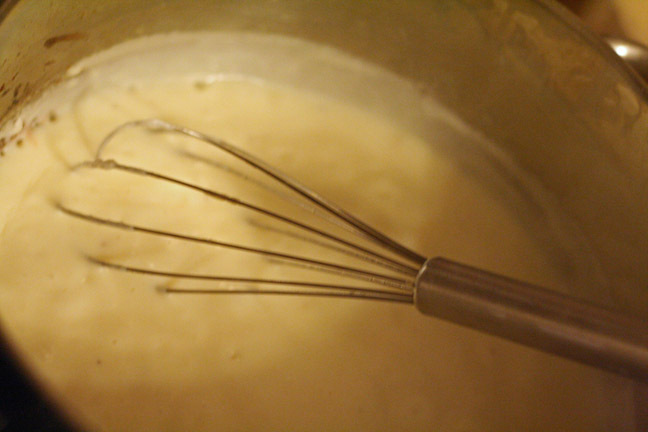 Then whisk in 3 cups milk, and continue whisking over medium heat until it’s also thick and bubbly. I apologize for the pictures… the lighting in our kitchen is horrible! and whisk until melted and smooth. 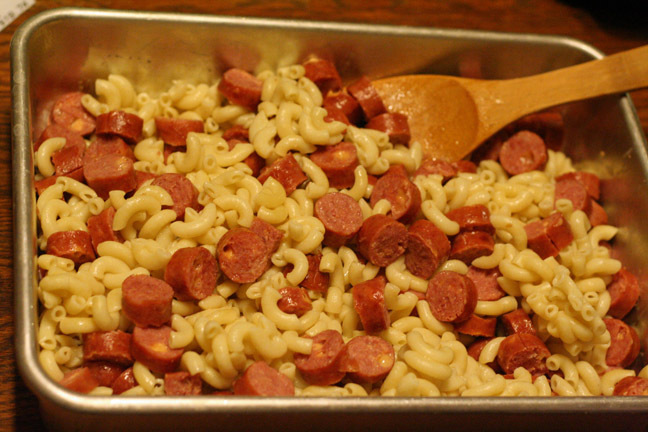 Drain the cheddarwurst, slice them up and stir them into the macaroni. Stir those in, too. No need to drain them. 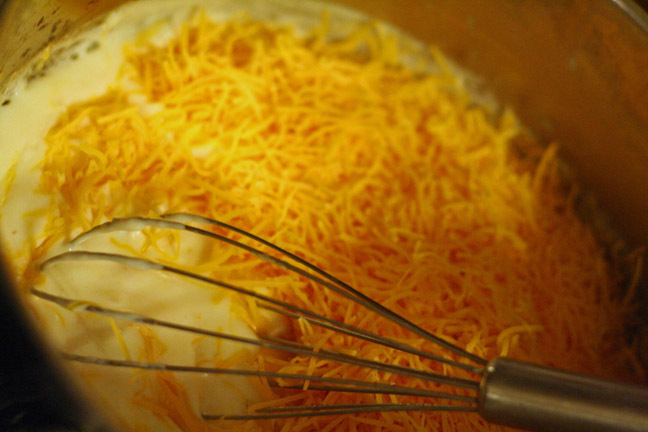 Then dump the cheese sauce over the whole mess, stir, cover the pan with foil, and bake at 350 degrees for 40 to 50 minutes. The moral of the story? Don’t be afraid to take risks in the kitchen. And watch out for computer programmers, you never know what they’re going to do!